According to Wall Street Journal investing colum­nist Spencer Jakab, most of us have no idea how much money we’re leaving on the table—or that the average saver doesn’t come anywhere close to earning the “average” returns touted in those glossy brochures. We’re handicapped not only by psychological biases and a fear of missing out, but by an industry with multimillion-dollar marketing budgets and an eye on its own bottom line, not yours. Unless you’re very handy, you probably don’t know how to fix your own car or give a family member a decent haircut. But most Americans are expected to be part-time fund managers. With a steady, livable pension check becoming a rarity, we’ve been entrusted with our own finances and, for the most part, failed miserably. Since leaving his job as a top-rated stock ana­lyst to become an investing columnist, Jakab has watched his readers—and his family, friends, and colleagues—make the same mistakes again and again. He set out to evaluate the typical advice people get, from the clearly risky to the seemingly safe, to figure out where it all goes wrong and how they could do much better. ·How a typical saver could have a retirement nest egg twice as large by being cheap and lazy. ·Why investors who put their savings with a high-performing mutual fund manager end up worse off than if they’d picked one who has struggled. ·The best way to cash in on your hunch that a recession is looming. ·How people who check their brokerage accounts frequently end up falling behind the market. ·Who isn’t nearly as good at investing as the media would have you think. He also explains why you should never trust a World Cup–predicting octopus, why you shouldn’t invest in companies with an X or a Z in their names, and what to do if a time traveler offers you eco­nomic news from the future. 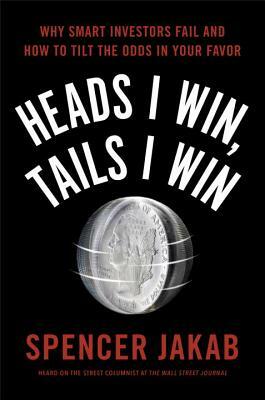 Whatever your level of expertise, Heads I Win, Tails I Win can help you vastly improve your odds of investment success. SPENCER JAKAB writes for and edits the “Heard on the Street” col­umn for The Wall Street Journal and previously wrote its daily investing column, “Ahead of the Tape.” He has also written about investing for the Financial Times, Barron’s, and Dow Jones News­wires. Prior to becoming a journalist, he was a top-rated stock analyst covering emerging markets at Credit Suisse. This is his first book. "Jakab has crafted a cool-headed guide for those who are of necessity the part-time financial managers of their own retirement accounts… Heads I Win, Tails I Win provides a plain-spoken and accessible starting point for busy part-timers anxious to improve their odds. If you’re one of those people for whom investing is more art than science, this book is for you. Even if you think it’s more science than art, it’s also worth reading, if only to learn how the other half thinks."